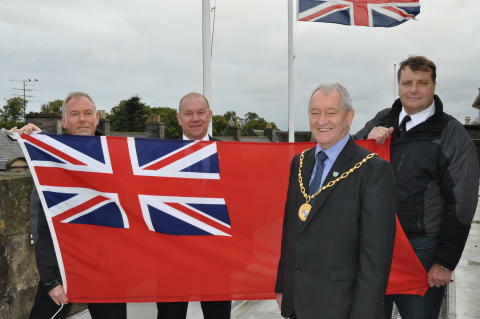 The men and women of the British Merchant Navy – both past and present – were remembered in Moray today when the Red Ensign was hoisted over the council headquarters building in Elgin. 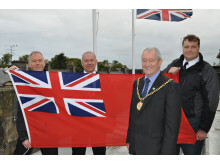 The brief ceremony, carried by Moray Council convener Councillor Allan Wright, coincided with Merchant Navy Day which honours the contribution made during both wartime and peacetime by members of the merchant fleet. September 3 was designated as Merchant Navy Day in commemoration of the 128 passengers and crew of the British merchant vessel SS Athenia which was torpedoed just a few hours after war was declared on Germany in 1939. 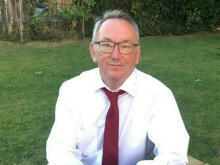 Every council in Britain has been asked by the Seafarers UK charity and the Merchant Navy Association to fly the Red Ensign – commonly referred to as the Red Duster – today. As part of the ceremony, Councillor Wright read a message from the president of Seafarers UK, the Earl of Wessex, which said: “On this Merchant Navy Day, I very much hope you will support the campaign by Seafarers UK to remember the sacrifices, salute the courage and support the future of the often unsung personnel of our Merchant Navy. 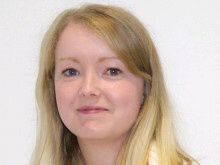 “Too often they are the forgotten or invisible service. By raising the Red Ensign you will ensure at least on this day they are remembered. See 'related material' section for high res image and names/titles of subjects.